1. 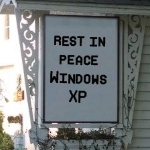 Make sure you deploy the very latest XP update so that those machines start out their afterlife as “healthy” as possible. 2. Isolate the old XP devices on separate “dirty” networks to make sure the compromised XP boxes do not infect new machines. 3. Keep these XP machines behind a hardware firewall like a NAT router. 4. Reduce the attack surface and get rid of all unused (third-party) apps, and disable Internet Explorer. 5. Install Google Chrome, which supports XP until at least April 2015, Use the VIEW option of Chrome as much as possible. For Windows XP users, it’s really time to move on. You can certainly take these steps to improve security, but the underlying code will no longer be enhanced or updated as new XP security threats emerge. Change is always hard, but the end result will be a more secure operating system. I have McAfee and PCmatic. What else should I do?